Refit2018: New Sails, New Engine, New galley appliances, New faux wood paneling main salon floor. SWISH has two electric fans in each cabin. Guests find these are quite sufficient to sleep comfortably, along with open hatches to feel the fresh air breezes from the trade winds, and it´s environmentally friendly! There´s also shades for hatches and windows plus two large sun awnings. Captain Peter’s love of sailing is not surprising. Yachting is central to the posh resort town of Lake Geneva, Wisconsin, where he spent his youth. He describes himself as “the wayward son”, wedged in the middle of five siblings. Summers were spent sailing past storied beaches, bucolic parks and Gilded Age mansions, or racking up awards racing catamarans. After college and a short career in psychology, he bought a little monohull and set out for new horizons. Eventually, he was crewing on ocean going vessels and absorbing the fundamentals of passage making in the Mediterranean and Atlantic oceans. Four decades and a million wonderful memories later, Peter hasn’t lost an ounce of zeal. He has raised and educated two sons, mostly at sea, spending winters in the Bahamas and summers on the U.S. East coast, or in Venezuela. When the boys were capable as helpful crew, the whole family set off on a remarkable circumnavigation. Today, both sons are highly accomplished and among their many talents, experienced captains. Becky spent her childhood in London, her teens and early 20s in Donegal, on Ireland’s rugged, northwest coast, and summers with Dad and his family in Spain. She did a lot of amazing things. Her “very hardy life” on a small Irish island in the North Atlantic required commuting by row boat in very cold, rough water. She worked with the Irish Civil Defense ambulance emergency team. She helped a master boat builder construct a Viking ship. She achieved diplomas in holistic massage, anatomy and physiology, reflexology and courses in Reiki. Becky says, “I love fresh, healthy food, especially colorful vegetarian dishes with delicious sauces, and Mediterranean cuisine. Guests rave about my homemade bread, tasty pastas, fresh fruit salads, cakes and puddings.” In addition to cooking great meals aboard SWISH, Becky might find time to chat about her family’s 1911 50-foot Norwegian gaff-rigged ketch, or her three Atlantic crossings, or the big posh yacht in Guatemala with an owner who accidentally threw himself overboard. With Becky as your chef and hostess, your charter adventure in the Bahamas could include delightful ingredients you never even imagined. Guests enjoy sharing time with little Bella (a Schipperke dog), especially with the dolphin swimming or walks or games on the beach, but equally for clients that are not doggy lovers. In the 1690s, the Schipperke became popular watchdogs on the barges in Belgium and earned its name schipperke, meaning ´little captain´ in Flemish. Peter will arrange to board Bella for the duration of the charter if required. 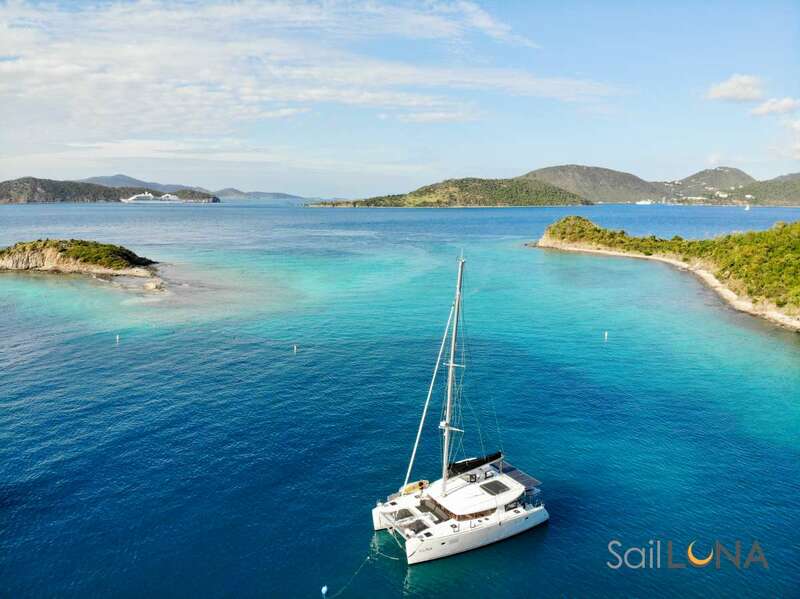 Offer: Swish offers a $1000 discount on listed rates for week-long charters taking place in March and April, 2019. Send us an inquiry to get specific pricing for Swish. 4-11 February, 2019 in Bahamas – Fantastic! We had a delightful time aboard Swish! Thank you for the wonderful hospitality and showing us your piece of paradise. Becky’s skill in the kitchen made our visit healthy and delicious. Peter’s skill in navigating the islands and currents was legendary. Love exploring the caves, the reefs and appreciated the way you motivated us to see the sights, and also relax. Best wishes, until next time! Where to begin? You showed us a g,reat time. Thank you! Becky, your cooking is amazing. You are an absolute sweetheart, wish I lived closer, I’d love to be your friend. The boat was so much fun and I loved our room – cozy. I just can’t say enough about the fantastic time we had, you are both such wonderful hosts. And friends! Thank you, thank you, we’ll be back! Hugs! 8-15 April, 2018 - Captain only charter ~ A beautiful Adventure! Thank you for touring us through this beautiful adventure. We cannot believe the endless shades of blue and the purity of the land. Your knowledge and patience and kindness ads a priceless feature to our journey. What incredible memories we are taking home with us. What a trip! Endless clear waters to the end of the earth and just us!! The pics, the iguanas, the sting rays! Everything was amazing and relaxing. Thank you for making your best our home for 6 days. We will be back! P.S. The food was delicious and light! Very professional captain and crew. They were very courteous and pro-active, super attentive and knowledgeable. The meals were healthy, super breakfast and they make their own bread! All good. The catamaran is clean, well maintained. Cabins were clean and comfortable. The itinerary was amazing and perfect! 21-27 March,2018 ~ A Life Adventure! There are family vacations, and then there are life adventures that are etched to memory forever. This week has been both. From the moment we set sail on Freebird, to the incredible sea life, bluest waters ever, kayaking to sand bars, and much savored meals, we thank you both for this life event. P.S. Thank you Becky for getting the boys to eat new foods! I want to formally thank you for your can-do enthusiasm, excellent meals, and for your calm. We hope to be able to complete essential parts of Clay´s thesis project at some future date. 22 December, 2017 ~ Awesome! Wow! What a wonderful week on your AWESOME boat Freebird! The food was fantastic, Becky! Memories we have made for a lifetime! We will see you again. You couldn’t have taken better care of us! Thank you for showing us your beautiful part of the world. Fly high Freebird! 2-9 September 2017 ~ Fabulous! Thank you for a FABULOUS trip aboard the Freebird! Your hospitality and kindness made us feel so welcome and at home here. Thank you for all the adventures, the snorkeling, and the drift dives. This has been the trip of a lifetime! Thanks again for everything! P.S. Give Bella some extra cuddles for us! 29th March - 2nd April, 2017 ~ The Most Beautiful Place! Thank you so much for a wonderful birthday/anniversary celebration. This is the most beautiful place we have ever seen. Ya´ll have been the most gracious hosts. Thank you for turning your boat over to us. We have made so many memories: from the slow ride on the water, relaxing, to the entertaining people at the Flip Flop beach. The food was absolutely amazing! We will be back, anxiously awaiting a cook book! Maybe one day we will meet you on our own boats and sail together! Lots of love to you! February 18-25, 2017 ~ Honeymoon Dreams! We have had a most wonderful time with you and Bella and your Freebird. Our honeymoon could not have been more fitting to our dreams and desires. The sailing, the snorkeling, the amazing waters! Who knew that there were so many shades of blue? What incredible creatures we have seen! The sea turtles, the lobster, the conch, the rays, the iguanas, and swimming pigs!?! And way too many fishes to keep count. And amazing little Bella on board! We had every confidence in Peter´s captaining skills. And he always had us anchored in the right place for each new adventure. What a great dive guide! What fantastic meals we have had!! Fresh caught lobster and conch, ribs, lamb, and seafood quesadillas. And always a glass of wine, a cold beer, or a Dark and Stormy at the right moment. What a dream come true for us! Thank you for sharing your life stories. Thank you for introducing us to the spirit of the Bahamas and the cruising way of life. We will be back! No doubts! We will be back! August 6-12, 2016 ~ Exumas ~ Amazing Adventures! Our daughter´s fascination with the swimming pigs brought us to the Exumas. From the moment we set foot on Freebird, it was like we were staying with family. Our kids were entertained the entire week from sting rays to exciting drift dives to afternoon naps on the trampoline. We had a week full of amazing adventures and much-needed family time. Your knowledge of the area is second to none! We loved eating fresh caught conch and lobster. And the swimming pigs were SO MUCH FUN! Thank you for a week full of adventure and fun! Day 1, Fed tame stingrays and free-dived the blue hole in Georgetown. Day 2: Feeding of the swimming pigs at Glass Cay, free-dived 2 blue holes at Sugar Cay, cast-line fishing off stern of Freebird. Day 3: Caught a big fish while trolling en route offshore. Drift-dived Rat Cay, collected conch and sea biscuits off the bottom, Williams Cay paddle-boarding. Day 4: Rudder Cut drift-dived grotto (3 turtles, 2 sharks, 1 cuda sighting! ), speared 2 lobsters, and free-dived underwater piano with mermaid at David Copperfield´s island. Day 5: Lee Stocking drift dive, speared 2 lobsters, fed wild iguanas, snorkeled reef. March 30 - April 6, 2016 - with Guest´s pup too! Words cannot express how wonderful this week has been. You are truly beautiful people in every sense. The knowledge you have of sailing is so very impressive. We have felt safe and comfortable the entire time. I am a drift diver for the rest of my life! I really could get used to this. So many things will be in our minds for years to come. Thank you from the bottom of our hearts. Thank you for a wonderful week of adventure and relaxation aboard Freebird! You all made us feel welcome, at home and completely spoiled. We enjoyed too many thrilling and unique experiences to fully recount - one drift dive after another over glorious fish filled reefs, snorkeling in caves, watching the nurse sharks at Staniel Cay Yacht club, feeding the wild pigs and iguanas, walking isolated beaches, beautiful sunrises and sunsets, quiet anchorages, delicious cooking, watching Bella balance atop the bow of the dinghy as we sped across the water and hearing of your inspiring excursions around the globe. Spending this week with you has changed our definition of what is possible to expect from ´quality of life´. What a beautiful life you have here. Thank you so very much for sharing it and yourselves with us! Relaxing, carefree, adventurous, fun, interesting, so many positive words are needed to describe our fantastic week aboard Freebird with Peter. From the bottom of our hearts, we thank you for sharing passion and enthusiasm for the life on the seas and a little glimpse of how the Happy People live! Swish was previously owned and operated by Peter´s son Warren, so the comments below are related to Captain Warren. They had an AMAZING time and I think a few of their moments on the catamaran will be seared into their travel memory bank as such. They were so impressed with the captain and crews attention, the quality of the food, and especially the unique experience of eating conch for the first time). It was an incredible experience for them. Please extend my personal thanks to the crew for attending to their needs and for showing them such a good time. Overall, how would you describe your charter? Was the crew professional, congenial, and accommodating? Absolutely. Warren was knowledgeable and focused on trying to accommodate. Louise was almost always cooking up first rate meals while also navigating the nuances of our personal likes and dis-likes. Was the yacht clean and well maintained? Yes, Swish was beautiful boat and the Staterooms, the Galley and the Saloon were all clean and ready for their new guests when we arrived. How did you find the quality and presentation of the meals? Outstanding, the food and the presentation showed pride and skill. The boat was very nice...Warren and Louise were great. Louise is a very good cook..No reason to be worried about her culinary skills. Her meals were excellent right down to the presentation of the food. Warren, I´d like to share with you the fact that my client called me today gushing about his time with you guys on Swish. He went on about how I had made the perfect match...that their time on board was the best EVER. Thank you so very much. Broker M.R. Thank you so much for the update on the charter (they swam with a wild dolphin, hand fed a hawksbill turtle, caught 2 fish offshore under sail, engaged with 11 swimming pigs and 25 sharks at Staniel and dove the Thunderball Grotto). We love to get those replies when our charter guests are onboard. Thank you so much for taking care of them! Our Bahamas sailing charters include breakfast, lunch, dinner, snacks, and alcohol. We will accommodate special diets (diabetics, vegans) with prior notice. Fresh bread is prepared daily in time for an evening twilight dinner. Fresh homemade New Zealand yogurt is prepared everyday in time for morning breakfast.